One of my new favorite shows in the sky aside from the meteor showers that occur year round made an appearance as my birthday came to an end. 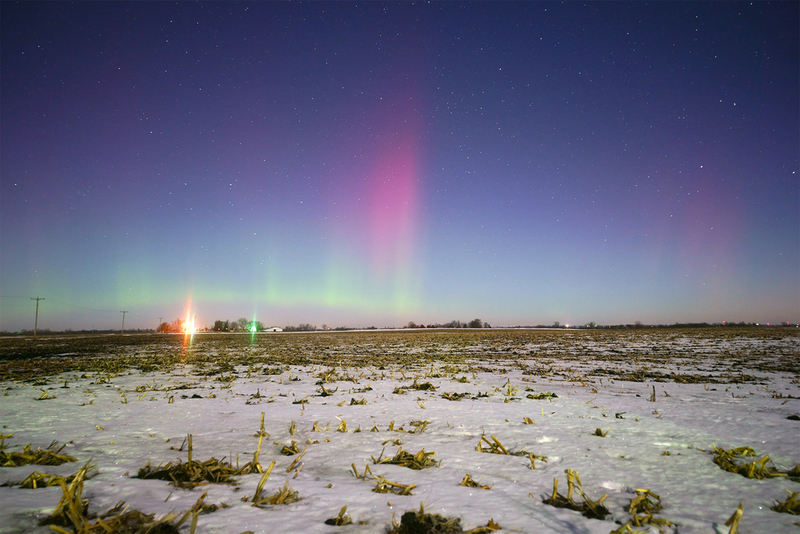 The Northern Lights were strong enough to be visible from central Iowa and it was truly a surreal few hours as I stayed outside until 4 am. I look forward to capturing the light show from a point further north but the show still managed to display some color and have a few pillar formations occur! Two local news stations aired the image below during their broadcast which was a nice surprise. I just enjoy sharing what those who were deep in slumber missed out on. It was quite the treat after a pleasant evening of drinks and sushi! I've got a wedding in a few hours and a studio tour immediately after, and somewhere in between it all I'm going to go shoot footage of the blizzard conditions that are expected to cover the state. So the lengthy blog potential will be cut short as my bed yearns for me to attempt to get some sleep.